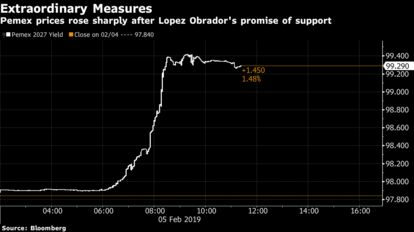 Petroleos Mexicanos bonds jumped to a three-month high after President Andres Manuel Lopez Obrador said he would announce measures to help the debt-laden company. Investors are hoping that any new package will be a significant step up from the $3.5 billion of tax cuts over six years unveiled last month. That announcement was followed by a slump in the bonds as Fitch Ratings cut Pemex’s debt to the verge of junk, citing the challenges of a company with $107 billion in debt and sliding output. Pemex’s dollar debt maturing in 2027 rallied 1.6 percent at 12:30 p.m. in New York, pushing the yield down 25 basis points to 6.596 percent. The program Lopez Obrador is set to unveil will be in addition to the tax breaks already announced, presidential spokesperson Jesus Ramirez told Bloomberg News in an interview. Lopez Obrador’s comments at his morning press conference on Tuesday were light on specifics, and the market is still trying to gauge how big the proposal will be. For the company to borrow at cheaper rates, he has a lot more to do. Pemex needs to return to capital markets soon to make $5.3 billion in debt payments coming due by the end of May. The surge in optimism means some investors may be lining themselves up for disappointment. When asked if the new measures will include a capital injection for Pemex, Lopez Obrador said that the focus will be to reduce tax payments, though he didn’t rule out alternatives. Moreover, the president’s hands are tied as Pemex revenues account for about a fifth of the fiscal budget. The rally in Pemex bonds also spilled over into the broader Mexican market. The nation’s 10-year dollar sovereign yield fell 3 basis points to 4.405 percent as the benchmark stock index gained 1.5 percent. Some investors said Lopez Obrador’s comments could mean a bond sale is on the way.